In the winter of 2005, I, along with a few colleagues from the Bay Area urban design collective Rebar, liberated a parking space for human use. We transformed a single metered spot into a temporary public park and called it Park(ing). My Rebar co-conspirators and I were prepared for the worst. People in crowded San Francisco tend to be touchy about parking. Soon enough we did indeed hear from the city. But instead of the angry summons we expected, we had been invited to meet Marshall Foster, Mayor Gavin Newsom’s director of city greening, at a dark tavern near city hall. “How can we get you to do more of these?” Foster asked. We were floored. Rebar started as a group of artists and urban interventionists. Our position outside the city-making technocracy allowed us the freedom to experiment with our chosen medium — public space — without the risks inherent in public bureaucracy. Now the bureaucracy was asking how to get in on the hack. We masked our shock and suggested that the Newsom administration make Park(ing) an official city program: The city could create an avenue for businesses and residents to apply for a permit to convert underused street space into an amenity that served the community better. But why did scaling up a good idea have to mean ruining it? There is a fervent debate happening at the moment about tactical urbanism and its relationship to social equity. As a veteran practitioner of tactics, I’m also curious about their potential to catalyze long-term urban transformation and institutional change. In the case of Park(ing), our team at Rebar decided to scale up things on our own. First we created a how-to manual that would result in our two-hour urban intervention blossoming into a public participatory art project called Park(ing) Day, a day-long peaceful takeover of parking spaces in cities all across the world. The global participatory project eventually helped to seed the creation of a parklet program in San Francisco, Pavement to Parks, that allows businesses and neighborhood groups to turn underused street space into small parks where benches and tables, or even a tiny mini-golf course, can be installed. Over the last decade, our own Rebar team has evolved from an informal art collective into a professional art and design practice. Former Rebar partners Blaine Merker and I joined forces with Gehl Architects last year to found Gehl Studio, and Matthew Passmore founded Morelab, Oakland. By far the biggest change within all this has been the pace at which bureaucracies have begun to adopt tactics to catalyze urban change. By now, there are hundreds of Marshall Fosters in cities all across North America asking how to hack public space. 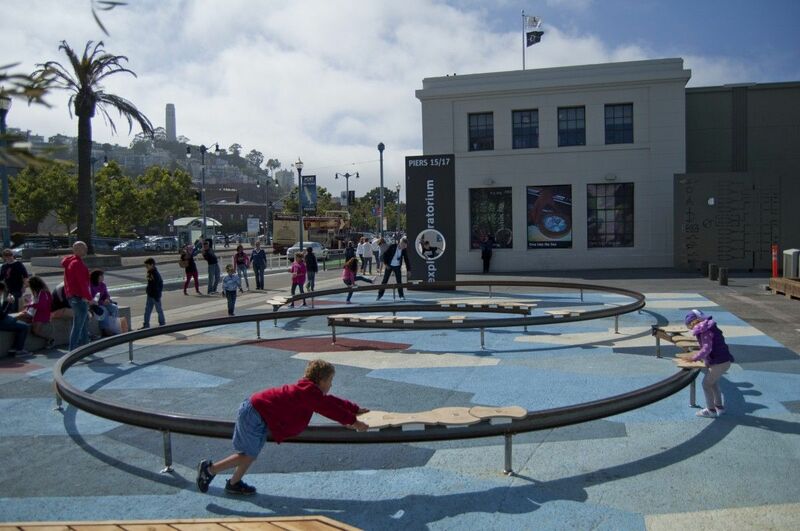 An installation designed by the Exploratorium as part of the City of San Francisco’s Living Innovation Zone program, a program created in collaboration with Gehl Architects. From very early on, Rebar’s most successful projects were those that used tactics with strategic objectives. 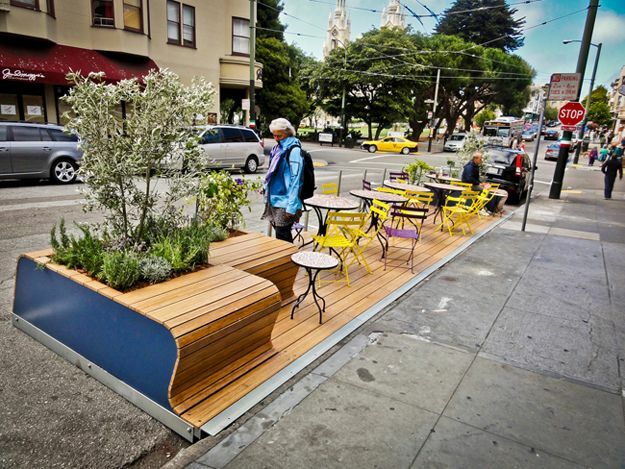 The Park(ing) Day to Parklet story is one example. 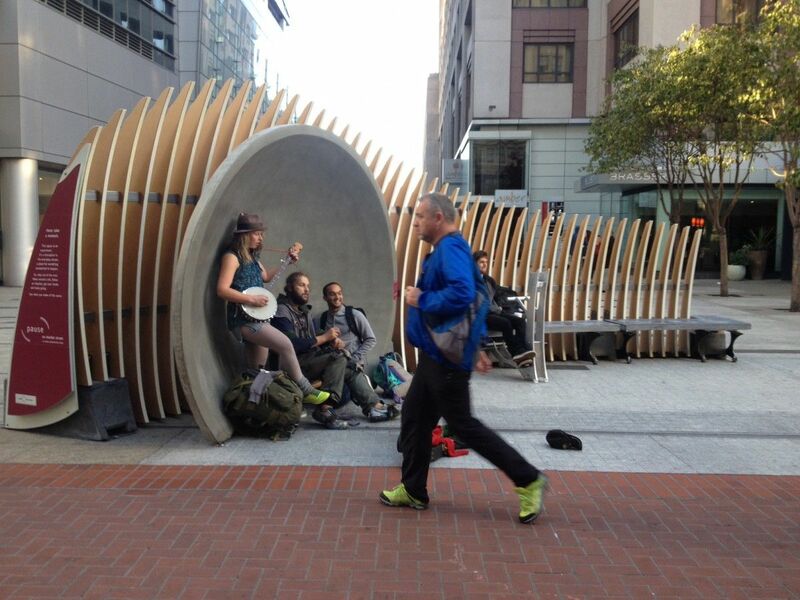 Our second urban project, Commonspace, a yearlong exploration of San Francisco’s Privately Owned Public Spaces (POPS), is another example of an artist-led urban intervention that catalyzed institutional change. Meanwhile in New York, Janette Sadik-Khan, the transportation commissioner under Mayor Michael Bloomberg, had begun to use guerrilla tactics to activate public space. It was an interesting reversal: Guerrilla tactics were coming from the top down. Frustrated by political roadblocks preventing the mayor from passing ambitious policies like congestion pricing, Sadik-Khan and her colleagues at the DOT discovered that framing new initiatives as “pilot” projects enabled them to circumvent the typical lengthy environmental review. Empowered by Gehl Architects’ evidence-based design approach, the Public Space Public Life framework, and by a formative trip to Copenhagen, Sadik Kahn and her colleagues used tactics like parklets and painted bike lanes to transform Times Square and Broadway. In a virtuous urbanist circle, San Francisco created its Pavement to Parks program after visits from Sadik-Khan and Gehl in 2008. Yet by 2011, doubts about the model had begun to creep into debate. In San Francisco, SPUR held a panel discussion “The End of Temporary” that positioned non-permanent parks and installations — many of which surfaced during the Great Recession — as tools that had outlived their utility. The questions deserved a response. I call mine “Iterative Placemaking.” Best exemplified in San Francisco by the Jane Warner Plaza project, and in New York City by the transformation of Times Square and Broadway, Iterative Placemaking consists of a phased series of physical interventions followed by evaluation to shape a place over time. It puts tactics in the context of longer-term change. Project for Public Spaces calls this “Lighter Quicker Cheaper.” Here at Gehl, we call it Measure Test Refine, and now offer a service called Early Activation, which is akin to what the private development community calls it Phase 0. Early Activation can seed culture, commerce, recreation and play on a site or in a neighborhood prior to permanent brick and mortal construction begins. Temporary use — which has always been a part of urban growth and development — now has new currency in the making of cities. Informed by tactics used in times of resource scarcity, Iterative Placemaking appears to have utility for both public sector and private sector agents of urban change as a tool to guide and focus strategic investments. Iterative Placemaking can generate cultural capital that translates to real estate equity, or political will to realize major urban transformations. It appears that this approach is here to stay. Guerrilla bureaucrats within government are increasingly using tactics to circumvent their own organization’s inherent tendency to resist change. But what happens when city bureaucracies and private developers adopt the tactics of guerrilla artists. Do they lose their potency and radical potential? Do they actually result in more resilient and just neighborhoods? Can tactical urbanism catalyze institutional change? These questions become critical when asked within a larger dialogue about equity. Part of a bureaucracy’s role is to ensure that public resources are shared equitably across a city. That can get complicated when the bureaucracy is relying on private partners to supply the resources. In San Francisco, we learned this lesson the hard way when parklets began to be associated with gentrification because they were first rolled out in affluent neighborhoods that could afford to make them happen. In the neighborhood where I live in the Mission District, the local neighborhood association has blocked parklets because of concerns about rising real estate values and displacement. In contrast, Philadelphia’s parklet program has implemented their program differently and from the outset sought to introduce the open spaces to neighborhoods with varying demographics and income levels. There has been far less controversy. Aware of their own limitations, the savvy folks within the City Design Group within San Francisco’s planning department are attempting to use tactics to hack their own technocracy. Inspired by the Park(ing) Day to Parklet story, by the Urban Prototyping Festival, and informed by Gehl’s evidence-based design approach, and the Living Innovation Zone program, The City Design Group has created the Market Street Protoyping Festival — a user-generated, tactical urbanist approach to generate novel ideas, and potentially, new permit instruments or operating procedures to transform Market Street, San Francisco’s main commercial spine. The machine is attempting to hack itself by generating citizen-led innovations in order to circumvent its own lethargic bureaucracy. Empowered by the success in NYC, the Gehl Studio offices in NY and SF are utilizing a combination of strategy and tactics in an effort to catalyze transformation of cities worldwide. Having recently completed a set of pilot projects in collaboration with the City Authorities from Sao Paolo, and Mar del Plata in Latin America, to closer to home in San Jose, we will be intently observing the evolution of iterative placemaking in the context of bureaucracies large and small. As the tactics of guerrilla artists become adopted into the operating procedures of city government, this draws a new frontier for further tactical action. Today’s tacticians must push beyond the pop-up and the temporary and seek to hack the DNA of organizational structures themselves. John is an urban designer and landscape architect focused on public space design. As Rebar founder and principal, John has created some of the group’s most groundbreaking and memorable work such as Park(ing) Day, The Panhandle Bandshell, The Civic Center Victory Garden, Parkcycle Swarm, and others. In 2014, he joined Gehl Studio, the US based practice of Gehl Architects, with offices in San Francisco and New York.